YORK, PA., U.S.A., January 26, 2015: Extrusion and blow molding innovations that substantially reduce downtime, save energy, and enhance automation will be on display at the NPE2015 exhibit of Graham Engineering Corporation (Booth W3142). One highlight will be a demonstration of a new modular extruder design for medical processing that reduces job changeovers to a matter of minutes while preserving clean-room integrity. American Kuhne Modular Quick-Change™ extrusion system. This system radically reduces time for job changes and removes the contaminating change-over activity from the clean-room environment by “hot-swapping” the barrel, screw, and die head. The modular extruder design allows the removal of the barrel and its replacement by a pre-heated barrel with pre-mounted tooling, all within a few minutes. The process will be a live demonstration at the show. American Kuhne SMED Quick-Change™ design options. These extruder design options minimize change-over time and maximize production availability. Design options displayed on the energy-efficient American Kuhne E3 extruder at the show will include: rapid screw change via quick-mount pusher; fast material change via rotary hopper design; and instant tooling change via dual-hinge design. Welex XSL Navigator® control system. An example of the synergy across the brands, XSL Navigator® is adapted from the award-winning XBM Navigator® control system, which Graham Engineering has used on its blow molding systems for nearly a decade. The XSL Navigator now offers intuitive navigation on a Welex line that makes it easy for the operator to set up quickly and work easily with the machine. Built on a ‘soft’ industrial PC, the system also enables processors to integrate data from a machine or line to an ERP system using client-server architecture. 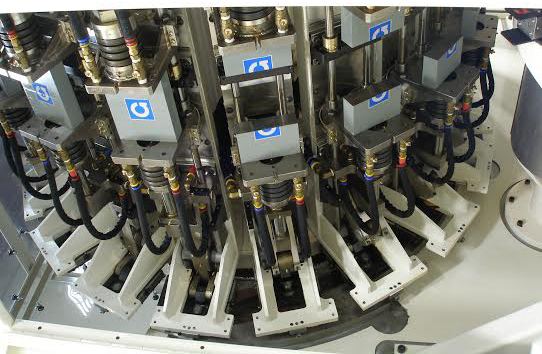 Features of XSL Navigator® will be illustrated on the roll-stand of a Welex sheet line. Welex Converge CTS™ & Welex Hercules® sheet lines. Company representatives will also be available to take visitors through presentations of Welex Converge CTS™, dryer-less Conical Twin Screw technology for processors running PLA and PET, and Welex Hercules™ industrial sheet lines. Welex Converge CTS™ provides energy savings potential and superior IV retention versus parallel twin screw designs due to its higher pressure and torque capability, resulting in reduced dwell time. In its trial of the Welex Converge CTS™ system, NatureWorks measured virtually no loss of molecular weight through eight passes of its Ingeo® PLA resin. Graham Revolution MVP™ rotary wheel extrusion blow molder. NPE2015 marks the commercial launch of the next generation of the flagship Graham wheel technology, Graham Revolution MVP™, that features an all-new, Modular Clamp design as well as a Variable Pitch option. These innovations enable flexibility and configurability to allow a range of package sizes to be manufactured on a single platform. And the modular clamp enables offline maintenance, repair, or replacement of a single clamp station to minimize downtime. The modular clamp design will be exhibited on the Graham High Speed wheel and the variable pitch feature will be demonstrated live at the show. Graham Engineering Accumulator Head one-hour color or material change-over. The innovative design of Graham Engineering’s spiral flow diverter head enables it to be lifted for easy cleaning. This enables color or material change-over to take place within one hour, saving material vs. conventional change-over that requires multiple, large shots, as well as valuable production time. Visitors can see the spiral flow diverter head in its retracted position as well as a short video of a live change-over.